Everyone is happier on an island, even the dogs. We first noticed this in Catalina, where we saw a very contented looking dog and cat napping at the local mini golf place. We were fairly relaxed, since this was our second day on the island and we didn't have anything more pressing to do than play a round of mini golf. 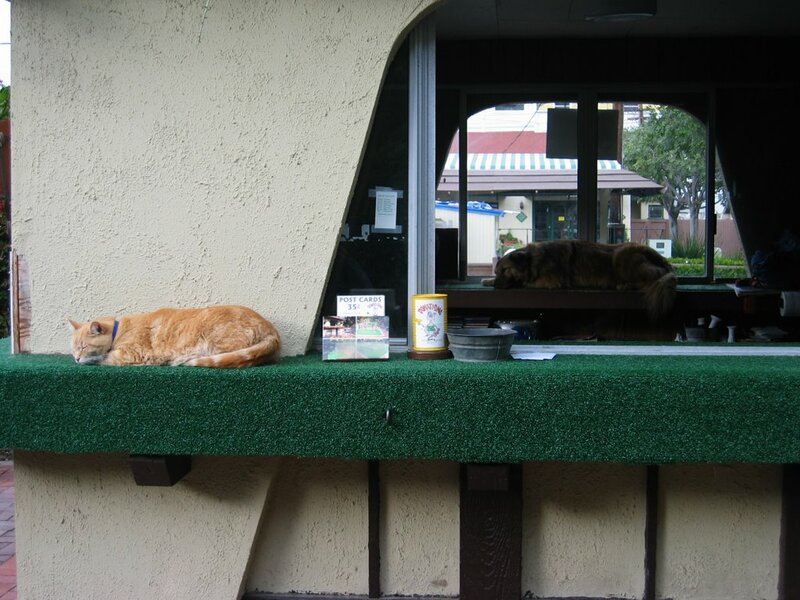 However, this dog and cat were clearly far more relaxed than us. 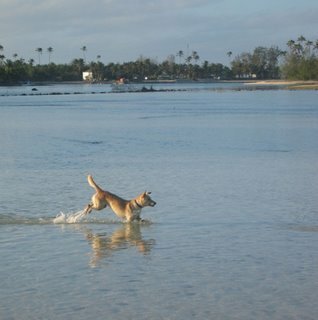 The neighbor's dog during our second visit to Rarotonga increased our suspicions about the relative happiness of island animals. We were staying in a lovely beach front cabana. The dog that lived next door quickly adopted us, sleeping on our patio and following us when we took walks on the beach and even when we went for a kayak in the lagoon. In fact, Toyoa, as we learned she was called, seem to particularly enjoy frolicking in the lagoon, as this picture shows. Our suspicions were confirmed in Thailand, though. We spent our first night in Thailand in a beach town called Hat Pakmeng. The next morning, we went for a walk on the beach. The Hat Pakmeng beach is not a particularly beautiful beach by Thailand standards- it has a long shallow bit that is not all that different from mud flats. However, it was our first day in Thailand after several weeks in Malaysia, and we were enjoying our walk. I was particularly enjoying the fact that I was wearing shorts, since I had been culturally sensitive and kept my legs covered during most of our stay in Malaysia. We were not walking for long before a local dog noticed us and came over to beg for attention. This was perhaps the most miserable dog I have ever seen. He was mangy, hungry, and covered in sores, the source of which became obvious after watching him for a couple minutes. The poor thing was infested with fleas. He scratched at them vigorously, causing new sores to open before our eyes. We felt sorry for this miserable dog, who was so pathetic I could barely stand to look at him, but we certainly weren't going to pet him. Later that day, we took a short boat ride to our true destination, Ko Ngai, which is a small island not far from the mainland. The contrast between the dogs we found on this island and the pathetic creature we had left in Hat Pakmeng could not have been more striking. The island dogs were happy, well fed, and free of fleas. They spent their days sleeping in the sand and their nights wandering through the beach bars getting petted by the equally happy tourists. Indeed, it was not just the dogs who were happy on Ko Ngai. My husband has declared it his new favorite place on earth. We tourists were very content to spend our days snorkeling in the warm water and sleeping in the shade on the sand and our nights chilling in the excellent beach front bars. It makes you wonder why we only visit islands.